The month of September was declared Self and Small Pub Month by April from My Shelf Confessions and Rebecca from Kindle Fever. I took part with a slightly more focused theme: The 4 Ps of Self-Publishing. I had a blast participating in this theme. I was really lucky to get most of the posts done before the month even started, so I almost had a blog vacation this month. Which worked pretty well since I felt like my brain was fried most nights because I have been doing a lot of training at work, and have been spending two nights a week at my sister’s babysitting for her. I got to connect with a lot of awesome authors, and together we gave away a ton of ebooks. I think I will do this again in the future, but not for a few months. Next time I do this, I will try to incorporate some of the things I missed. The big one that jumps out at me is book covers. I didn’t write about them anywhere, and they are definitely a big part of any book. Tell me, what did you think of my themed month? Would you like to see me do it again? Was there anything else I missed? The other big event this month was my blog makeover. I am extremely happy with it. I love my reading zebras. In September -18 – This is more than I expected. I did sneak in a couple short stories, and read quite a few of my review books. Year-to-date – 182 – I should definitely reach my 200 book goal this year, and will likely surpass it. Which is absolutely amazing. Reviews – 9 – There will definitely be more next month, if only to catch up and post reviews for the books I read this month. E-book Challenge – 100/100 – Finished this month! – I will be participating in NetGalley month hosted by Red House Books. I am going to try to get all six of my NetGalley books read and reviewed. 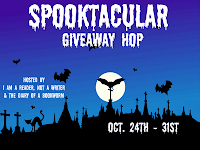 – I will be participating in the Spooktacular Giveaway Hop from October 24-31. There are currently almost 300 blogs signed up to participate. I don’t know what I will be giving away yet, but I’m sure I can come up with something. Did you have fun with NetGalley October? Can you stop by again and let me know what you read?